Now, if you’re the kind of person who likes originality, and wants something that nobody else has, then going custom is a great option. Not only will you get exactly what you want, but it will be yours and yours alone. There is also the question of quality. If you are buying from reputable vendors and workrooms, the quality will almost always certainly far surpass any mass-market item. A good analogy would be to think of it as the difference in buying Couture versus buying at Kmart. How much? 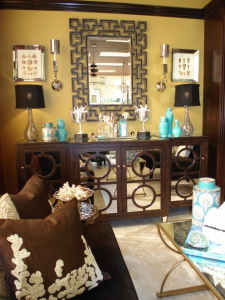 Well, in regard to case pieces like cabinets, credenzas, etc., usually you’ll be starting with an existing template of piece of furniture and will be modifying that. Expect to add about 10-20% for any change in size, and the same for a different finish (if the finish you want is not considered “standard”.) Doors can change, as can hardware, and prices can vary based on selection. In regard to upholstered pieces, you’re purchasing an existing frame of a sofa, chair, etc, and then separately purchasing the fabric that you want to have upholstered onto that piece. There are literally tens of thousands of options here and one of the most exciting things to do in Interior Design. You have your choices of color, fiber content, texture, style, weight, etc. Maybe a contrasting cord? Maybe a contrasting pillow? Nailhead trim? Have some fun with it!! The important thing to remember is that custom furnishings are pieces that you keep around. They have been made to your specifications and with handmade quality. You will probably have them forever. Case pieces, if properly taken care of, can (and should) be passed down to the next generation! 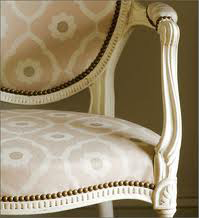 Upholstered pieces will also last for decades, assuming that you change the fabric every 10 years or so. The idea here is that once you buy the piece, you’ll never have to buy another again. So, buying custom furniture can actually save money in the long run. Case in point: my mother has had the same sofa for just over 30 years. It has a very classic silhouette, an excellent quality wood frame, is very comfortable, and goes with most decor. She spent a pretty penny on it (even back then.) Over the years, as styles change and the mood strikes, she has changed the fabric three times. It is currently a very nice Mediterranean Blue chintz, with Royal Blue cord on the pillows. Now, given that most mass-marketed sofas are designed to last 5-8 years before needing replacement. When you add up the cost to buy 4-6 new sofas in 30 years, versus the cost to buy one good one and having it reupholstered twice in the same time period, it actually saves a lot to go the latter route! This is definitely something worth thinking about for your home, if it does fit into your design budget. Frankly, I think it’s even worth waiting a little bit to make sure that it will. There are lots of great companies to work with, and the experiences I’ve had are usually rewarding on delivery day! For more information on how to incorporate custom furniture into your home and for some great images, click here!